A Southern Grace: the tilde is key. I just realized that since I was a kid I've been saying that Christopher Columbus sailed the ocean blue on the Nina, the Pinta, and the Santa Maria. I was wrong, of course, for all these years. It was the Niña. I feel foolish. To my credit, I've always pronounced piña correctly, though I guess I've never used it in any context other than piña colada. You can't ignore that tilde, folks! That, in case you were confused, was my segue into these piña-colada-inspired cucpakes. There's lots of coconut involved in both the cupcakes and the frosting, and the filling is basically pineapple flambeed in rum. Yowza. So...maybe these are so outstanding that I'll be forgiven for my tilde transgression? To make the filling, first stack the pineapple slices and cut into quarters, then into a small dice. Heat sugar in a large skillet over medium-high, stirring, until sugar melts and turns golden brown. Add pineapple; toss. Carefully pour in rum; immediately tilt skillet slight to ignite alcohol. (If using an electric stove, use a long match to ignite alcohol.) When flames subside and caramel melts, carefully stir in cream, orange juice, and vanilla-bean seeds. Reduce heat to medium; boil, stirring occasionally, until thickened, about 5 minutes. Fold in the coconut. Let this stuff cool completely before using or storing. Make the cupcakes and frosting as instructed in my earlier post. To fill the cooled cupcakes, carve out a cone-shaped hole and carefully spoon the pineapple-coconut innards into the hole. 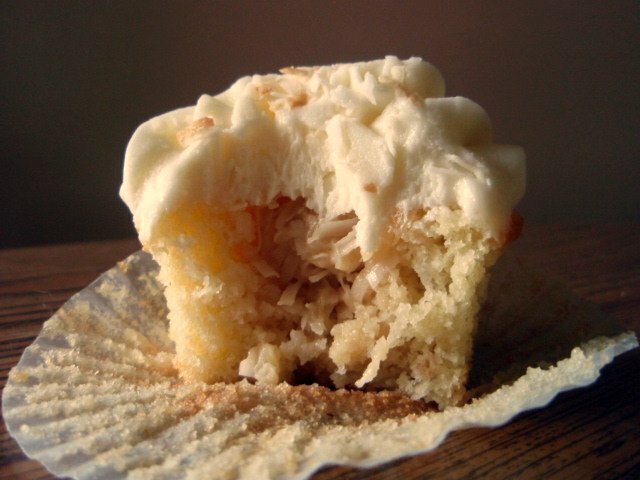 Apply frosting generously to cupcakes, sprinkle with toasted coconut, and eagerly stuff your face full of piña goodness. One of my favorite cocktails... Those cupcakes must taste heavenly! Another picture perfect creation! I love coconut and would love a dozen of these babies. Me thinks you need your own bakery Grace! Love piña-colada so I'd be all over these cupcakes! Do you like piña colada, and getting caught in the rain? (well, yes, and no.) Great cupcakes! I need to buy more cupcake pans. I can't make enough to keep everyone happy, and you keep providing me with these heavenly ideas! How can a pina colada not just make you happy? 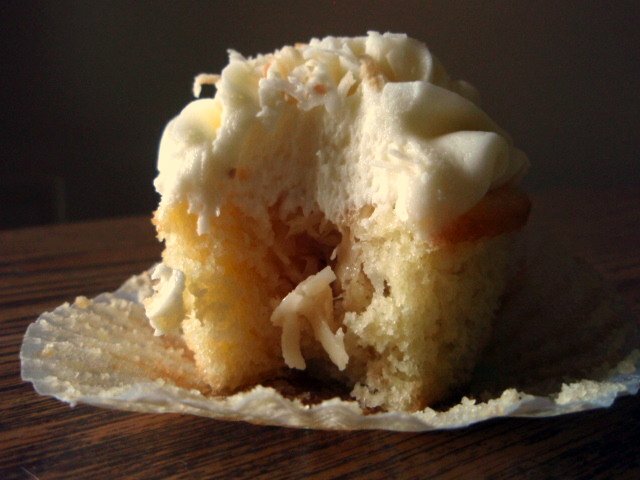 And, a pina colada cupcake--same situation. Love that filling. grace I love these piña colada cupcakes look delicious! I love that pocket of coconut! Who wouldn't love 1 or 2 of these georgous creations? MMMMMM,...! They look awesome, tasty & well-flavoured too! I could eat WAY too many of those beauties... YUM! Wow! I love a pineapple-coconut combination in a cake! Those look amazing,Grace! Wow doesn't this look fantastic! I'm loving the texture of coconut and fruits too in fact. Yum! This is the way to go for pina coladas since I always like to chew my calories rather than drink them. I'm not a huge fan of coconut, but I love a correctly used tilde. I ove to drink pina coladas so why not eat one as well. A really good drink turned into a cupcake? Life is good! What a gorgeous pairing! ...and your cake looks very moist!! Give anyone one of these cupcakes and you are SURE to be forgiven! Brilliant! 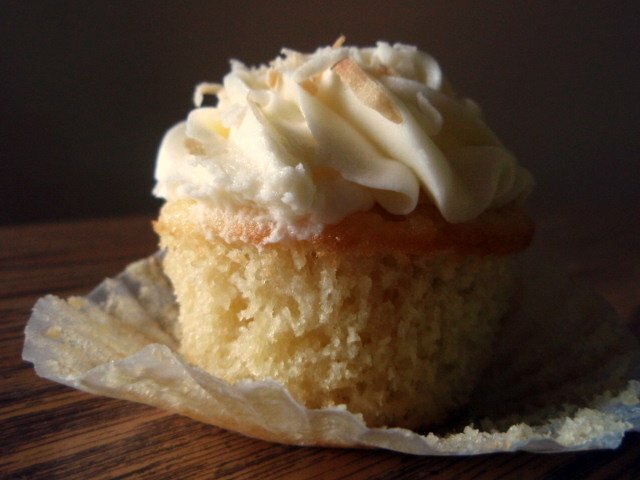 A pina colada in a cupcake. You are such a clever girl....it's my favorite drink. I'm pretty sure I've said Nina also! I'd better make these immediately to atone! Pineapple flambeed in rum?? Wow! I LOVE all the flavors here! Oh Grace...I wish I could reach through the computer screen and grab the cupcake...looks awesome...and the filling sounds amazing...reading your post, it sure got my mouth watering. Maravilloso cupcake esponjoso y tentador una exquisitez,abrazos hugs,hugs.